We never get sick of showcasing Chicago's abundance of creative entrepreneurs. In fact, its one of our favorite things to do. So, when we heard about Danka Marinkovic's art gallery/salon hybrid (that's right), we just had to know more about the method behind her beautiful madness. Marinkovic's story starts out like a familiar entrepreneurial tale we've heard before. She decided to take the risk and quit her corporate 9-to-5 in an effort to follow her true passion: art. But with her savvy business woman mind-set, she knew that opening a gallery in the midst of a shaky economy was probably not the safest idea — no matter how insatiable her appetite for the arts was. 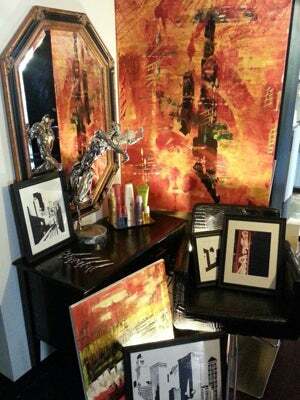 So, she beefed up her concept by adding another element of artistic expression: a full-service boutique salon. Located in River North, Desdimi Gallery Salon offers cut, color, and style services in a stylish and creative atmosphere that feels less like a salon and more like a hip friend's pad. All of the technician stations boast crocodile-patterned styling chairs and cabinetry crafted from antique sewing machines. The gallery, itself, is showcased on the surrounding walls, making Marinkovic's concept seamless — not disconnected. Desdimi features between 30 and 50 pieces of artwork from both emerging and established artists, including sculptures, paintings, and more. And to keep things fresh while providing as many creative peeps as possible an opportunity to show off their talent, Marinkovic regularly rotates the art every four to six weeks. If you're on the market for a new stylist, we suggest checking Desdimi out on the weekend. Its "continental Saturdays" includes a haircut, complimentary continental breakfast or brunch, a beverage, relaxing scalp massage, and paraffin treatment. We promise, by the time you're through, the only work of art won't be on the salon walls. Desdimi Gallery Salon, 770 North LaSalle Drive (at Chicago Avenue); 312-488-4869.